Married Couple With 7 Children LIVING UNDER A ROCK For 30 YEARS! You think you can Never OWN Your own Home? Well this man had a dream at the age of 8 years old! He first saw his future home at the age of 8 ,and he had decided that one day he would be living there! Benito Hernandez is now living and working as a FREE man, and he is his OWN BOSS too! He even works for himself at his own hours. His job is close by his home, and he has no need to pay for fuel to get there! Benito never has to worry about someone climbing the Corperate ladder to get above him! Benito's job is safe. Benito and family can never be evicted from his home either! Benito has sole rights to his home,and to his job. He is never burdened with an electric bill, to use his PC, or to watch his favorite Real Life Survival programs on the Television. He is no distractions from the things that make him happy. He says he is very content ,and happy with his wife, and his childred,and grandchildren. The family enjoys fishing, and the family enjoys going Raw Gem Hunting, as these are some of the families favorite hobbies.They got lucky a few times they said., and that this makes it all worth it. They go on many picnics while enjoying the Clean Fresh air, and Sunshine. Many visitors have traveled to see his home, and his free way life style. The visitors say, they think it is great that there are still some people that can live inderpendantly on their own, and not have to resort to Goverment handouts. Anything is possible if you put your mind to it! This boulder is 130 feet high. It is cool in the summer months, and warm in the cooler months. They are not hampered with Snakes or Bugs. Life under a rock is better then most people dream it could be! bluesbaby5050: That's Exactly the Reason I posted this story! You understand my point I was making! Where there is a Will ,there is Always a way! Thank's for the cool video! That was great! People are truely awesome,and we have Lord EN-KI to thank for this! How cool! I absolutely love it :) People living free and following their heart. I posted some more pictures that go along with this too,and some more information on what Benito does for a living,and how they survive,OFF THE GRID! This is why I posted this,as it Fasinated me! He has True Guts, and Imagination too! My kind of people! LOL! edisonik: Rocks stand the Test of Time. Rock is the Foundation of Strength. Tarheel: Nice ROCK, and I like it. Some more pictures,and information on the way Benito makes a living,and what they like to do in their spare time. Also, Notice Benito is ADDING onto his home,as he has a wheelbarrel,and more bags of Cement off to the side. 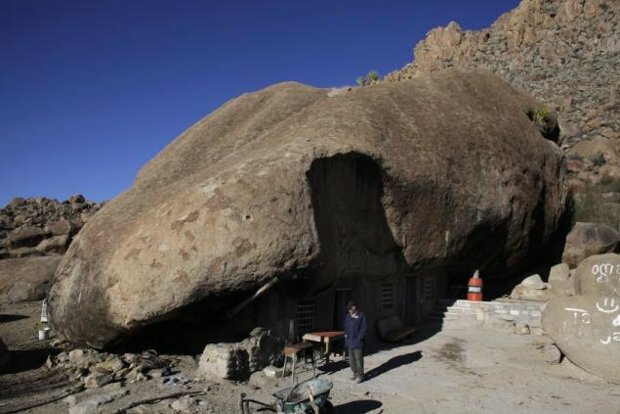 Also the space cut/chipped out of the top of the boulder is to let in more sunlight into their home by way of the windows at the bottom,near his 2 doorways. He also has a big rock with a smiley face ,and other drawings on it too. This boulder looks to be very sturdy,and well into place. A tree,or a bush is also growing out of the upper right side of Benito's boulder,follow the cement steps.